Take a visit to The Monument and find out about the events of 1666. Fly through the narrow streets of London before the Great Fire. Watch a video about a replica 17th-century fire engine, similar to fire engines that would have been used during the Great Fire. Follow the events of how the Great Fire started, spread and was fought. What was is it like for people who experienced the Great Fire? Fascinating facts about the streets and buildings of London swept away by the fire. Fire! Fire! Find out about the Museum of London's exhibition about the Great Fire. 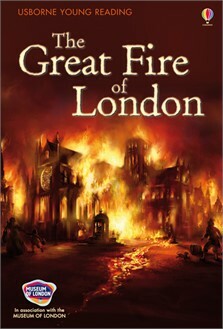 Help a young boy survive the Great Fire of London. Try a test-yourself quiz about the Great Fire. For Minecraft players, free maps from the Museum of London, of the city before, during and after the Great Fire. A simple and dramatic introduction to the Great Fire of London in 1666 - what caused it, how it spread, how it was put out and how the city was rebuilt. Colourful illustrations on every page help bring history to life, along with maps and photographs of historical evidence and simple informative text. Ideal for homework and school projects - the Great Fire of London is now a compulsory National Curriculum topic for history at Key Stage 2.